Mexican street corn—or elote as it's called in Spanish—is salty, sweet, crunchy, and creamy in every bite. It hits all the right flavor notes, especially hot off the grill in the summer months when fresh corn is at its peak and abundantly available at every market. For a snack with so many layers of flavor, the recipe is actually quite simple. Ears of corn are rolled in a garlicky lime crema and crumbly queso fresco, a Mexican cow's milk cheese that's incredibly addictive (try it mixed into scrambled eggs, sprinkled atop avocado toast, or to jazz up a plain romaine salad and thank us later). Queso fresco and cotija cheese are similar fresh Mexican cheeses that are super crumbly. You can substitute with another similarly textured cheese such as feta if you can't find these two options at the local supermarket; it's a little saltier so you may want to use less of it. Looking for a weekend cooking project? Making queso fresco from scratch is easier than you think. To make elote less messy to eat, chop the corn in half and put the split ears on a sturdy skewer. 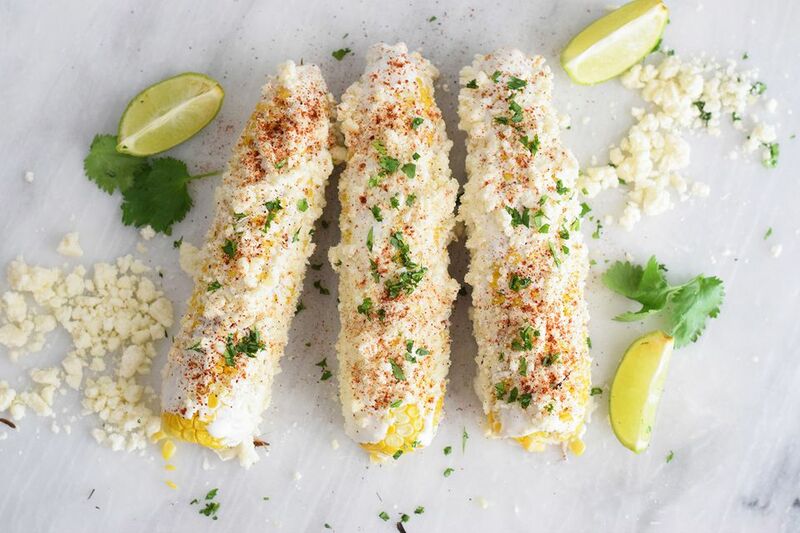 You can also take the corn completely off of the cob, toss the kernels in the crema, and top them with the elote fixings as a fun party dip or potluck side dish. This preparation is best warm, but it's also delicious served cold. Roast the corn on medium heat until sweet and tender, about 15 minutes. Cooking the corn in the husk will lock in more moisture, but you should de-husk when you're near the end of cooking and char alone on the hot grill for extra flavor and color. If roasting in the husk, remove silk from the cob. In a medium bowl, bring together the sour cream, mayonnaise, and lime juice. Using a microplane or a garlic press, grate the garlic into the mixture. Add the salt and whisk to combine. Spread the mayo mixture onto a flat plate. Combine the Parmesan cheese and queso fresco on a separate flat plate. Roll the corn in the mayo mixture and completely coat each ear. You can use corn on the cob holders to help you roll them; tongs will also work. Next, do the same in the cheese mixture and set aside on a platter. Top the corn with chopped cilantro and a sprinkle of chili powder. Serve immediately or refrigerate until you are ready to eat!